A great way to get started with a virtual tour business is to become a Google Trusted photographer for Street View. 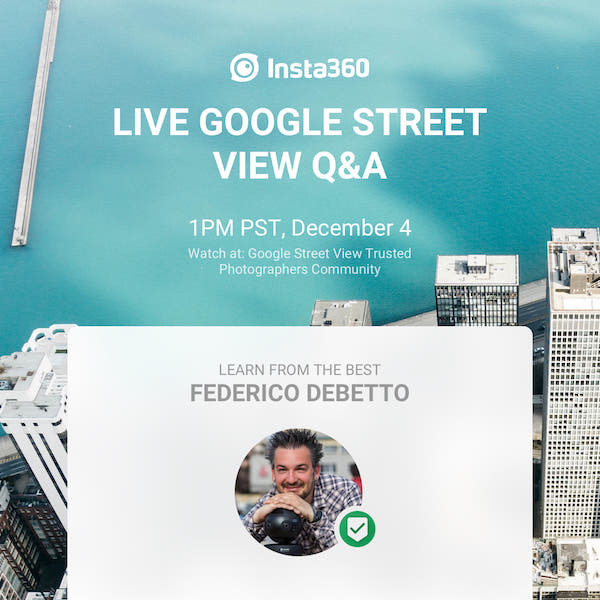 If you’re interested in becoming one, or you’re already shooting photos for Google Street View, check out this upcoming live Q&A with world-leading GSV photographer Federico Kiko Debetto, a Street View photographer since 2014. Becoming a Google Trusted photographer is an easy way to start your virtual tour business, to build experience and create a portfolio. You can also get a lot of exposure for your photos with relatively little effort. I’ve only submitted 63 photos to Street View but they have collectively earned 3.7 million views over the last couple of years. The Q&A with Federico will take place on December 4, at 1pm PT, and will appear on the Facebook group for Google Trusted Street View Photographers. The live Q&A is free, and is sponsored by Insta360. The Q&A will be preceded by a 30-minute video featuring their newest cameras, the Insta360 Pro 2 and the very popular Insta360 One X. You can register for the Q&A here and get a chance to win a voucher for $500 toward the purchase of a Pro 2 and/or $40 toward the One X. In the meantime, check out my introduction to becoming a Google Trusted photographer here.